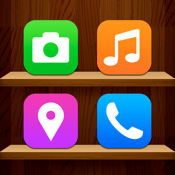 A collection of the best icon skins and app shelves for your device! Want your home screen more special & unique? Come and download this wallpaper! Make your own special iPhone!